Last week I opened up a pretty nice blaster of Pinnacle. This week I'm going with Donruss, Pinnacle's little brother of sorts. Donruss and Pinnacle currently have very similar pricing, but Pinnacle's higher quality makes it a no-brainer to go to. Donruss still has its merits, and can be a fun break, but it definitely sits second among the two. Like I said, I'd rather open up Pinnacle, but I also like variety in my collecting, so going for Donruss isn't a bad thing. You can still be surprised by getting something good out of a blaster of Donruss, so it is worth it to purchase it on occasion if you're looking for a fun and cheap break. In Donruss you'll find a few different insert cards as well as the opportunity for a hit. You pretty much get a hit guaranteed in Pinnacle, but it's no so with Donruss. Nostalgic collectors can look forward to finding the Rated Rookies in Donruss. That is a set of cards that I think is better than the Pinnacle version (Ice Breakers). This was an alright box of Donruss to open. Well... maybe more than alright since I was able to pull a jersey card out. I was a little disappointed to see so many base card packs though. It seemed to be a fairly high number. Each pack has 10 cards, so you're actually getting a good amount of base cards when you buy Donruss. It's just too bad the base cards aren't anything to write home about. In terms of rookies, I was able to pull three Rated Rookie cards. 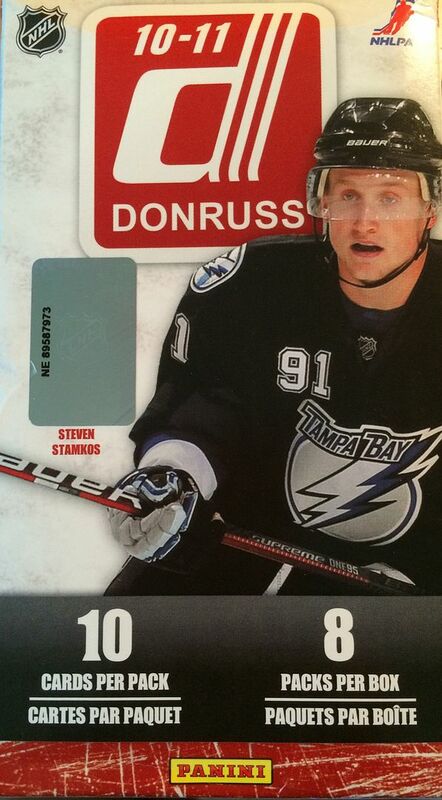 I'm still baffled by the fact that I haven't pulled more top named rookies out of 10/11 products recently. There were so many good ones that I thought I'd be bound to get one sooner rather than later. 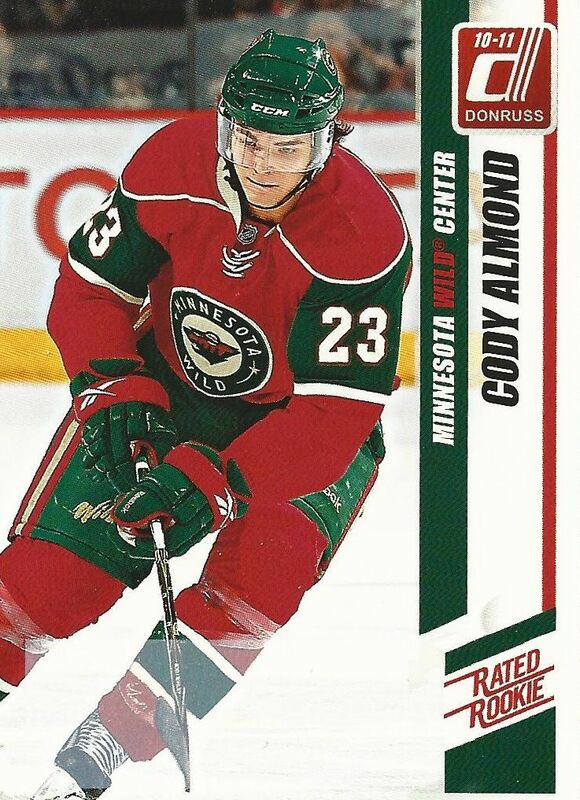 I pulled three Rated Rookies, but none of them were of any note so I just picked Cody Almond to represent the three rookies from the break. 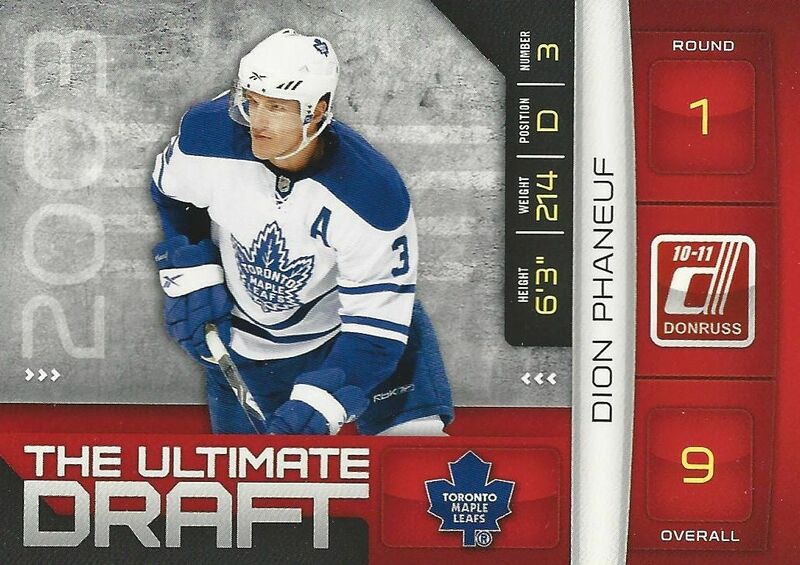 My lone insert card was this Ultimate Draft card of Dion Phaneuf. Phaneuf is a decent name to pull out of the cards as I've seen much worse to get. This set has alway puzzled me. I was pretty happy to get this 2-color jersey card out of the blaster. At first I thought it might be a prime card, but it isn't. There is no numbering, but it's probably one of the nicer things I could ever expect to get out of a blaster box of Donruss. Other than the surprise jersey card, there wasn't much going on with this box of Donruss. 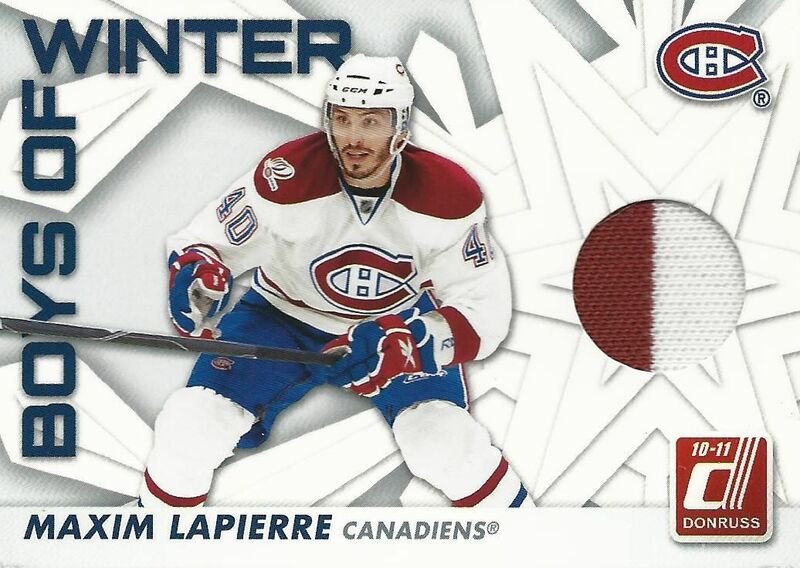 I am pleased with the hit though, and that makes up for a lot of the lackluster-ness of the rest of the box. I would still pick up Donruss just to have a little fun with it every-so-often. Donruss can be a nice little diversion when you need something to break on a slow day. Would love to see a blog post as a summary of which hockey product is the smartest retail box purchase, as you've been doing these for a while now!